The player starts the game by picking which camp counselor he/she wants to control. Each of the counselors is stationed in a different cabin across the map, and they have certain strengths and weaknesses, most prominently in terms of their speed and how high they can jump. No matter which character the player chooses, the player character starts out with an unlimited supply of rocks that he can throw at enemies (i.e. zombies, wolves, and bats), which sometimes leave behind vitamin jars to restore lost health, or more powerful weapons, such as a machete or a torch that shoots short range fireballs. 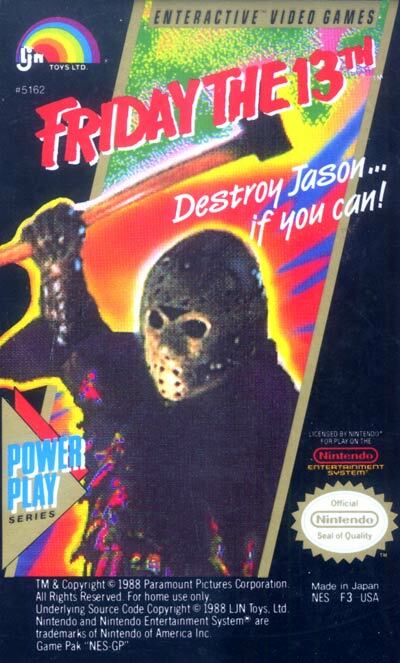 The player's ultimate goal is to obtain the pitchfork and to kill Jason. To get it, the player must venture to a cave where he will have to defeat the flying head of Jason's mother, which will have to be defeated several times before she will leave the pitchfork behind. Jason's mother returns to the cave after a battle with Jason.